Logging in and managing CloudExtend Excel for NetSuite Enterprise Users. 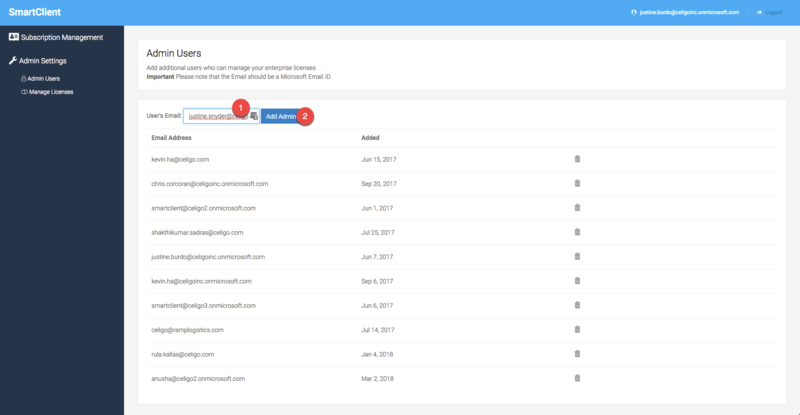 Step 1: Visit subscriptions.celigo.com and log in to the Admin Portal with your Microsoft ID (this was previously provided to your Account Manager). Step 2: Click on Manage Licenses. All your subscriptions will be displayed here. Step 1: Click on Accounts. This is where you can add your Production and Sandbox accounts. Step 2: Enter in your Account number (1). Choose from the dropdown if it is a Sandbox or a Production Account and click the + sign (3). Add additional Accounts if applicable. Step 3: Click on 'Manage Account and select the Authentication Methods you wish to enable for your organization. Note that if you select Single Sign On you must deselect Basic Credentials and Token Based Authentication. Step 1: Click Manage Licenses. Step 2: Click on Licenses. Step 3: Your subscription information will be displayed at the top. Below that you will see licensed users. To add a new licensed user enter in their email address (1) and then click Add User (2). Add as many users as applicable. Step 4: For each user's email you have added, you will need to add the NetSuite connections you want them to connect to. Click on (view) next to the first users name. Step 5: Select the Account's that you want the end user to connect to and click the + sign after you have selected the Account. Repeat this step for any of your other licensed users. NOTE: Each end user can connect to 1 Production Account and multiple Sandbox Accounts. Step 1: To remove a licensed user go to Manage Licenses. Step 2: Click on the Trash Bin next to the user you would like to remove/delete. Step 1: You can add additional users who can manage your enterprise licenses by clicking on Admin Users. Step 2: Enter the email of the user (1) and click Add User. The user is added to the list. To remove users, press the ‘Delete’ button (bin icon).